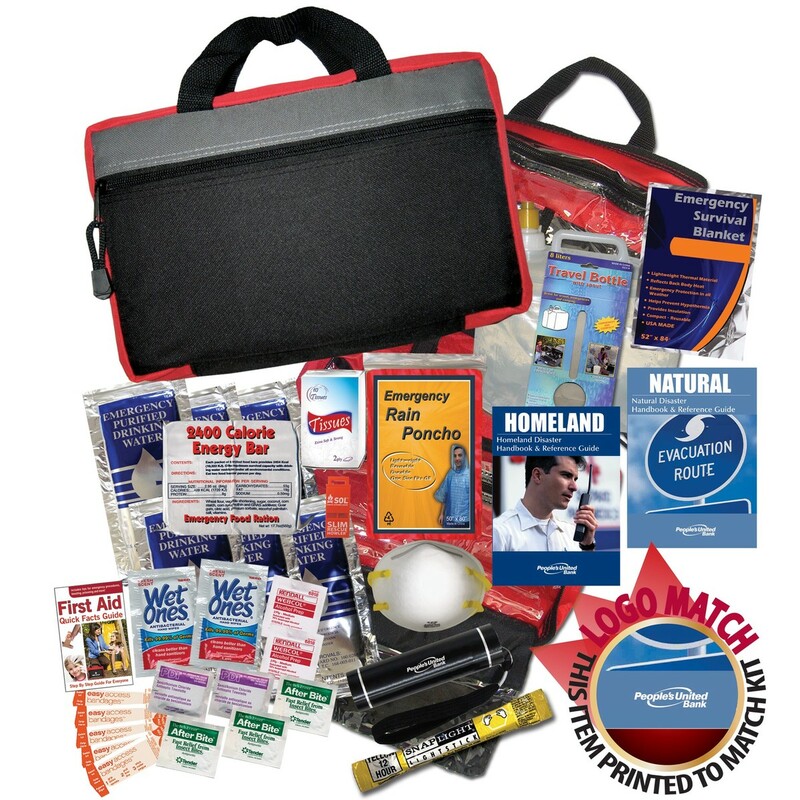 Natural disasters and other emergencies strike quickly and often without warning. 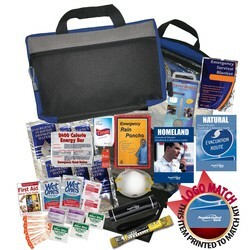 Keep yourself alive for two days in even the most adverse conditions for up to two days with this indispensable kit – all wrapped in an 11” x 7” zippered nylon case. 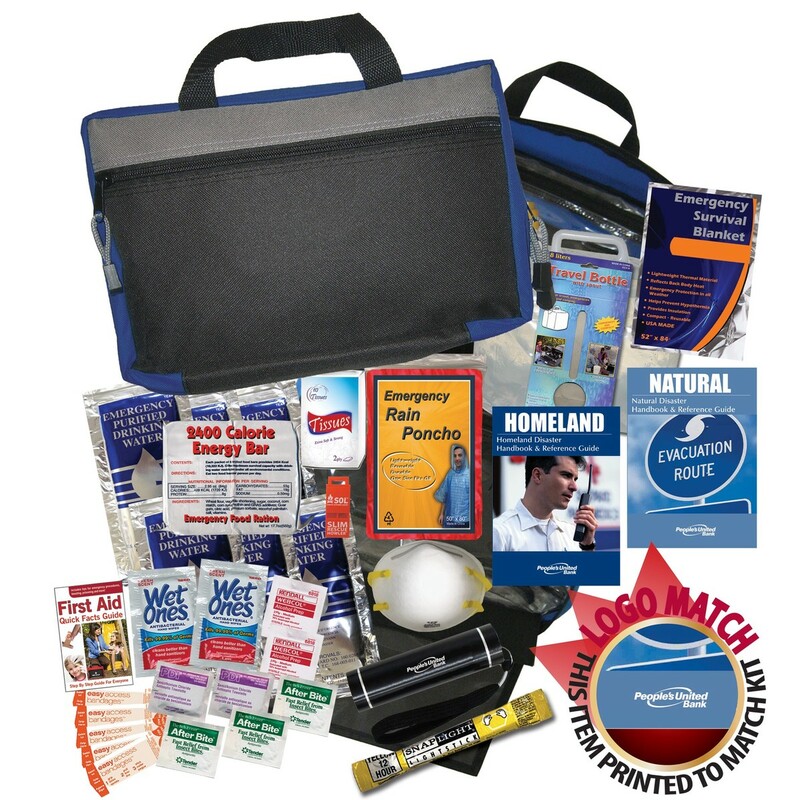 Choose from red or blue, and add your organization or business logo to create a branded promotion that makes a dynamic door prize at a survival or sporting goods related show or event. This kit includes 1 2400 Calorie Energy Bar Pack, 1 LED Flashlight w/ Batteries & Imprint, 1 2.5 Gallon Water Bag, 6 Emergency Purified Water Pouches, 1 Emergency Blanket, 1 Lightstick, 1 48pg Natural Disaster Guide w/ Imprint, 1 48pg Homeland Security Guide w/ Imprint, 1 Emergency Whistle, 1 Rain Poncho, 1 N95 Medical Grade Mask, 1 Tissue Pack, 2 Wet Ones® Wipes, 5 Bandages, 3 After Bite® Sting Swabs, 1 First Aid Quick Facts Card, 2 Alcohol Wipes, and 2 Antiseptic Wipes. Includes a 1 color screened imprint. Setup - $60.00R per color. PMS Color Match - $25.00R per color. Additional Color Run Charge -$0.50V. Imprint Area - 6"x3". Product Colors: Red or Royal Blue.